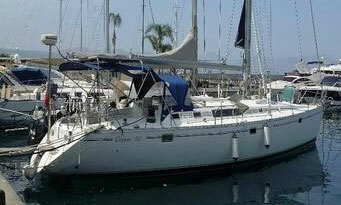 Blue water sailboats are the ultimate in offshore sailboats. They're intended for long-distance ocean sailing, often crewed by live-aboard sailors who have cut loose from conventional onshore living choosing a life of seaborne travel and adventure. "designed for extended voyages where conditions may exceed winds of Force 8 on the Beaufort Scale (over 40 knots) and significant wave heights of 4m (13 feet) and above, and vessels largely self-sufficient." As the Significant Wave Height is the average of the highest 30% of all waves and as individual waves can be twice that, it's clear that blue water sailboats and their crews must be prepared for pretty much anything the sea can throw at them. And with the likelihood of mid-ocean assistance being practically non-existent, blue water sailboats and their crews must be self-sufficient and equipped for all emergencies. Because there'll have to be plenty of stowage space for the considerable quantities of spares and equipment, together with stores and freshwater for a month or more at sea, it's unlikely that anything less than a 38 feet sailboat will be big enough. 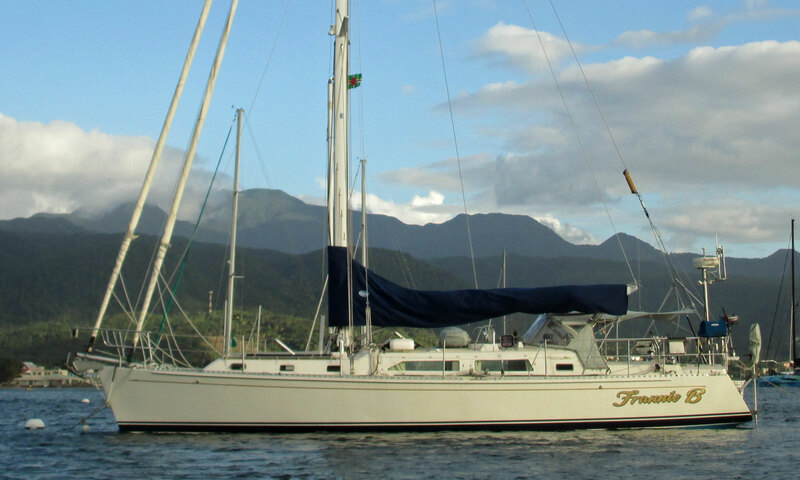 Probably 42 to 45 feet would be the ideal size bluewater sailboat for a cruising couple, which would provide an interior layout with sufficient accommodation for occasional guests or additional crew. 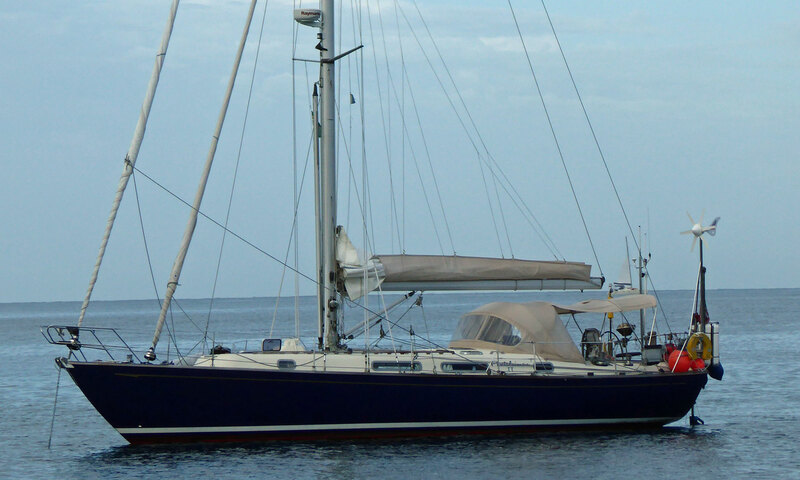 Some cruising couples, particularly those with deep pockets, choose to go for much larger blue water sailboats that have been specifically designed for short-handed crews. 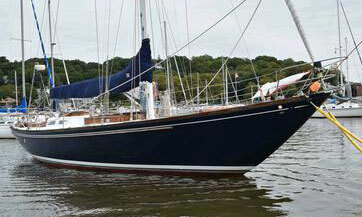 Chuck Paine's mouth-watering Apogee 50 and Steve Dashew's Sundeer 64 are good examples of these thoroughbred performance cruising sailboats. Their light, easily-driven hulls mean that relatively small, easily handled rigs are sufficient to drive them along at maximum hull speed. But whilst it's true that a good large sailboat will always be more seaworthy than a good small sailboat, it's a big mistake to choose one that's too large to be easily handled by two people. This is where opinions amongst bluewater sailors will vary most. Whilst a heavy displacement hull - particularly one with a full keel and long overhangs at each end - is likely to provide the most comfortable ride in heavy going, it will be a relatively poor performer in lighter conditions. Unless that is, it has a large sail area - which means that sail handling will be a problem for short-handed crews. A very light displacement will be limited in terms of stowage - to much additional weight will affect its sail area/displacement ratio and compromise its performance, and it's likely to be a handful to manage in heavy going. 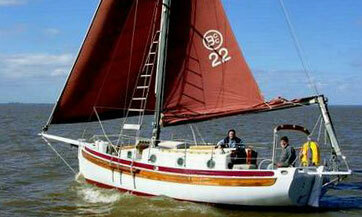 My preference is for a more moderate displacement hull, with a fin keel and skeg-hung rudder. 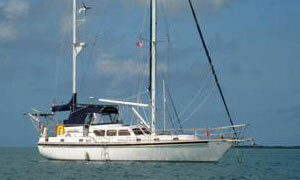 Manageability is the key issue here, ideally without reliance on power driven winches and other sailhandling devices. 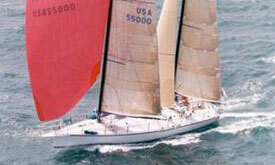 My choice would be a masthead cutter, either in sloop or ketch format. I'd go for a twin-groove furling gear on the headsail, a hanked-on staysail and slab-reefing on the mainsail - I'm not a big fan of in-mast or in-boom furling system on blue water sailboats. In storm conditions the staysail can be quickly replaced by a hanked-on storm jib and there should be a separate track on the mast for a storm tri-sail. Long periods of downwind sailing should also be catered for, using twin poles each rigged rigged with their own uphaul, downhaul and foreguy for the twin headsail tradewind rig. Either a conventional spinnaker, lightweight genoa or a cruising chute for light wind sailing will make up the sail wardrobe. If your halyards and uphauls are operated at the mast, then the security given by granny bars will be reassuring, especially in lively conditions. You must have sufficient freshwater capacity for the reasonable needs of all crew members on your longest envisaged passage, plus say a 20% contingency allowance. So for two people on a transatlantic passage, allow one imperial gallon per person per day for say, three weeks plus 20%, that's 50 gallons minimum. Ideally blue water sailboats will have double this capacity, split into two separate tanks so that if one tank gets contaminated the crew will still be OK. 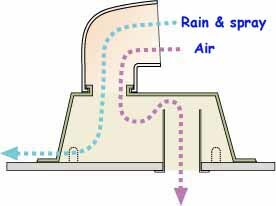 It's prudent to be able to rig some system to catch rainwater when underway and at anchor. Electrically pressured freshwater systems are extremely wasteful for both water and power, so a manually operated water supply at the galley and the wash-hand basin in the heads is essential. A separate seawater supply at the galley also makes a great deal of sense. A reverse osmosis watermaker can be an extremely useful device, but should not be relied upon as the sole source of drinking water on passage. They can - and do - break down. Sooner or later, blue water sailboats will find themselves becalmed in sea areas such as the doldrums (or horse latitudes), and their crews will begrudgingly reach for the engine keys. It'll be reassuring to have sufficient fuel to motor at four to five knots for 500 nautical miles or so. The amount of fuel needed will depend on the size and efficiency of the engine. For a typical modern 35hp engine using around half-a-gallon of fuel per hour, a fuel capacity of 60 imperial gallons would be about right. An aft cockpit, in preference to a center cockpit, works best in blue water sailboats. Deep, secure and well-drained it will provide good shelter for the crew. 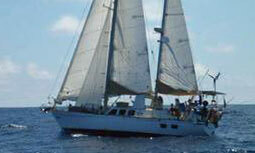 Headsail, staysail and mainsail sheets should be in easy reach of the helmsman. An adequate number of opening deck hatches and portlights will get a cooling breeze through the boat when at anchor, particularly so when equipped with a windscoop. Insect screens for all hatches are vital when in the tropics. Dorade vents will provide fresh air below when closed down at sea in bad weather. These clever devices will allow air to pass through into the accommodation, whilst ensuring that the rain and spray that would otherwise accompany it is deflected back from whence it came. Helming is fun for a while, but not for hour after hour. 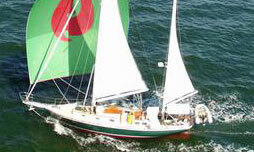 Windvane selfsteering is the way to go when under sail, and an electronic auto-pilot when under power. Good secure seaberths must be available for all off-watch crewmembers. These should be parallel to the sailboat's centreline and be fitted with lee-cloths. Generally, the interior layout must be properly optimised for both safety and practicality when underway, and comfort and efficiency when at anchor. It should be possible to get from bow to stern moving from on secure handhold to the next without break. 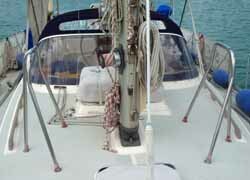 Similarly below decks, sufficient handholds must be available to prevent injury in boisterous weather. A sprayhood (or dodger, as they're known as by American sailors) will shelter the cockpit and its occupants from wind, rain and flying spray. They can be a either a rigid structure or a canvas version built around a collapsible stainless-steel frame. Incidentally, in the UK dodgers are the weather cloths (US) which are fixed to the guardwires to provide further shelter from the elements. But it's not just wind, rain and spray you should be concerned about. Too much direct sunlight can be far more damaging to our skin. 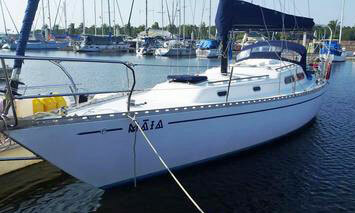 So no blue water sailboat worthy of the name will be without a bimini. At least two adequately sized anchors should be carried. One, the bower anchor, will be located in the bow roller and will have an all-chain road of at least 200ft (60m). The others may be on a combined rope/chain rode and can be stored below decks. Whilst this is by no means a full list of the desirable features to be found on blue water sailboats, it's a good starting point. But it's not complete, for instance, most bluewater sailors will want a reliable long distance communication system and a comprehensive inventory of safety equipment.